Natchez at last…. | RV There Yet? So where are we now? Waco!!! Joe and Janet said we HAD to go – and go we did. We completed our Mississippi adventure with a full day in Natchez – home to more Antebellum Homes (pre-Civil war) than any other place in the south. Because of its location and the fact that all of the fighting was going on just north in Vicksburg, there was essentially no damage to the lovely pillared homes of Natchez. It is a lovely town with houses to tour, shops to visit, horse drawn carriages to ride and wonderful food to sample. We did it all. It was a lovely end to our trip down the Natchez Trace and our time in Mississippi. All of the homes have wonderful stories (not to mention being amazing houses in and of themselves!). This one – Longwood was especially interesting. It is one of the only octagonal homes in the USA – but construction halted on it when the Civil War began. The exterior was complete – but only the basement was ever finished for the family to live in. Very cool house! So – if you love old homes (touring them not necessariy living in them!) 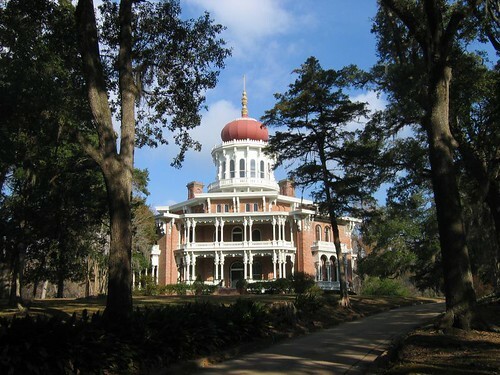 and Southern Hospitality – take a trip to Natchez. They have a wonderful Spring Pilgrimage that must be just wonderful! Previous PostIndian MoundsNext PostCan it b e? Texas! Check out the SOWER Website! Seeing the country……Serving our Lord! He has told you, O man, what is good;and what does the Lord require of youbut to do justice, and to love kindness,and to walk humbly with your God?